This week started out great! On Monday the HKDCS had their first theodolite tracking survey at the new land based station in Tai Ho Wan. It was a great success with two dolphin group sightings near the Brother’s Islands. It is encouraging to see the dolphins in the area because it used to be a major dolphin hotspot in past years. Despite this good start to the week, Tuesday, Wednesday and even today were spent indoors away from the rain and the wind. 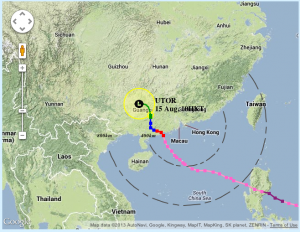 Typhoon Utor passed through the region and brought with it some heavy winds and rain. There was a T8 warning issued by the Hong Kong Observatory, and apparently the Beaufort sea-state had even reached a level of 8 on Wednesday. It’s a good thing our surveys were postponed to next week! This was my first typhoon experience in Hong Kong and I was quite impressed – the winds can get to be so strong at times! 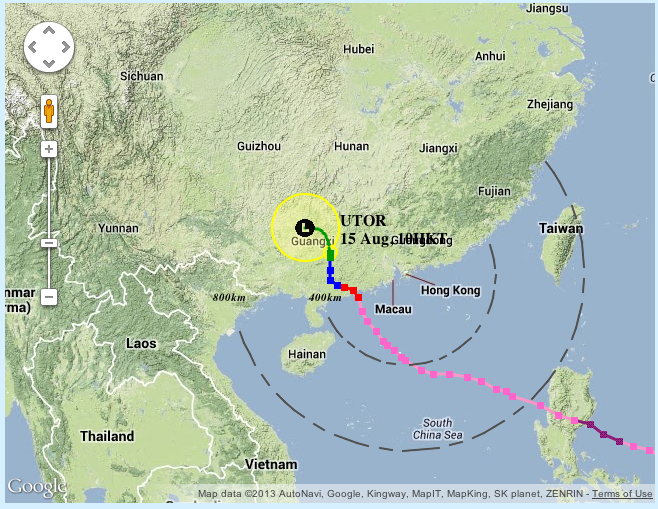 Although the typhoon has passed, the weather for next week still looks wet and windy. Here’s hoping we’re able to get more surveys in while staying safe and dry. I’m nearing the end of my internship with only four more weeks to go, and it’d be nice to finish off with some beautiful sunny Hong Kong weather and lots of dolphin sightings!